My father and paternal grandfather shared the same middle name, Melvin but the name is in honor of my great-great grandmother, Amanda Melvina Poorman. In America, her first and middle names were popular in the late 18th and early 19th century among descendants from Ireland, Scotland and England due to their literary use. But I was intrigued recently to learn that her father, John Poorman had been only the 31st person baptized into the Mormon Church barely two months after it was organized as the Church of Christ and nearly two years before Brigham Young. He was baptized by immersion on June 9, 1830 at the northern end of Seneca Lake a few miles from his farm by his neighbor David Whitmer famed as one of the witnesses who had actually laid eyes on the ancient “golden plates” from which the Book of Mormon was translated. Whitmer had been baptized a year earlier and was one of the six founders of the new restorationist Christian religion, today the third largest by affiliation in America. But those first eight years from mid-1830 to mid-1838 were tumultuous as much internally as from external persecution including several name changes as the new church rapidly grew to nearly 18,000 members, up to half in Great Britain. My great (x3) grandfather Poorman followed church leaders to the area around Kirtland (northeast) Ohio in early 1831, fighting off a mob of 40-50 men a year later who tarred and tried to suffocate church founder and prophet Joseph Smith. By 1833, Poorman was among the first couple of hundred Mormons who settled in northwestern Missouri along the western banks of the (Big) Blue River which at the time was the edge of the American frontier, long before the existence of Kansas City. Mormons including my ancestors there were defending themselves from mobs of vigilantes. These Mormons were from the northeast, with abolitionist sensibilities, when it came to slavery. The mobs were from the upper south and worried that voting as a block Mormons would threaten Missouri’s status as a slave state. Little did they know the discord and internal friction among Mormons at the time. The battle took place in an area along the I-435 beltway, an alternative route from I-70 around downtown Kansas City and one to which I will pay much more attention whenever future cross-country road trips with Mugs (my English Bulldog) take us along that route. The Blue River flows out of Kansas and just before it flows into the Missouri River near Independence, Missouri is where Poorman was involved in the Battle of the Blue in November of 1833 to fight off mobs of vigilantes. A few miles north, across the Missouri River in Liberty is where Poorman married my great (x3) grandmother Nancy Botkin Davis three years later, apparently four or five months after my great-great grandmother was born (ahem) and help to raise her children by a previous marriage. However, internal strife and power struggles were beginning to take a toll. Two years later, in 1838, his friend David Whitmer, who had headed the church in Missouri, suddenly resigned. 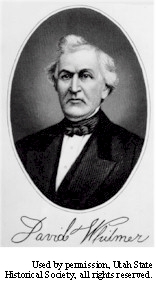 Refusing to defend himself, Whitmer was then excommunicated ostensibly as part of a coup to topple Joseph Smith over the then secret practice of polygamy as well as the word of wisdom. My Poorman ancestors had lived in the same Kaw Township settlement with Whitmer. While there is no record they were involved, I am sure it distressed them to see their long-time friend ostracized. Politics had taken a toll. Ironically, a little more than fifty years later and thirteen years after Whitmer’s death in Missouri, Mormon leaders would disavow polygamy but without reinstating those who had resisted it from the beginning. That fall of 1838 the Mormons were expelled from Missouri after the governor signed an extermination order. But my great (x3) grandparents were among a few who stayed, relocating about fifty miles north and a bit west to Washington Township, a few miles west of St. Josephs. Until then, this “nose” of Missouri had been set aside in treaty as Indian lands but by just as my Poorman ancestors sought sanctuary there, the area was being annexed into the United States as part of Missouri with Platte Purchase. Records show that the Mormon church lost track of the Poormans after 1840 so they would not have met many of my other ancestors then gathering in Nauvoo, Illinois as recent converts. But as the Mormons were also driven out of Illinois after the murder of Joseph Smith in 1844 and across Iowa in very early 1846, it is possible the Poormans were contacted by Mormon agents sent into Missouri to buy supplies. They may have also met members of the Mormon Battalion including several other ancestors as it marched through St. Joseph in route from Iowa to Fort Leavenworth in preparation for marching southwest into the war with Mexico. Mormons talk as if its members had all gathered in Winter Quarters, Nebraska or back across the Missouri River in Council Bluffs but these places were only major staging areas for the nearly half of all members preparing to head west beginning in 1847 when three of my ancestors paved the way. Approximately 15,000 members who were gathered along the river were scattered in 90 settlements, some only 20 miles from the Missouri border and only 60 miles from where the Poormans lived. Sometime around 1853, my great-great grandmother Amanda Melvina Poorman traveled up the Missouri and caught a wagon train west to join Mormons gathering in the Rockies, probably upon the death of her father. Her mother died the following year, just as Amanda, out west, was marrying George Washington Kent, someone with whom she had played during her early years in Missouri. She died in her early 40s and was buried in Richmond, Utah near the Idaho border, less than four years before her daughter Margaret would marry Hyrum Edward Bowman, two decades before they would head up into the Yellowstone-Teton nook of Idaho to a ranch where I was born and where they are buried. When my ancestors established the first settlement in my native Idaho, the Mormon Church had just surpassed 61,000 members. When great-great grandmother Amanda died, it has just surpassed 100,000 members. It reached 180,000 when my paternal grandfather Mel was born and 231,000 when my grandmother Adah was born. It crested 300,000 before they and my great grandparents homesteaded our ancestral ranch along the Henry’s Fork. Mormon membership reached 576,000 the year my dad was born on that same ranch and 664,000 when my mom was born. By the time I was born it had just passed 1 million. When my daughter was born and involvement lapsed more than forty years ago, membership was well past three million. When my grandsons were born it was surpassing 12 million and today there are more than 15 million, counting the 40% who are lapsed. It not only gives me pause to think my great-great-great grandfather was among the first 31 but I can empathize that the internal politics took their toll. The same occurred to my great-grandfather who married into that line when a Mormon Apostle and neighbor refused to take back a defective piece of equipment he had bought and then refused to let my great grandfather be buried in the clothing in which he had married my great-grandmother. Their son, my grandfather, famously caught a church Bishop stealing water while others were in church services. As the story is told, using he old Winchester hanging on my wall, he fired into the air as a warning. By the time I entered grade school, classmates had exaggerated the story giving me a reputation for toughness. My dad tried to be active as we were growing up but politics intervened when he was released after insisting there be no swearing during church ball games. Yet we have all lived lives intertwined with that culture and its values. I have other ancestors who joined shortly after John Poorman, most by 1840, and all had become Mormons by 1855 when there were fewer than 64,000 members. For several years after the Mormons settled in the Rockies, membership declined, in part, because of radicalization during a movement by hardliners called the Mormon Reformation. Several ancestors were dis-fellowshipped for speaking their minds when they disagreed with local church leaders over civil issues and controversial decisions and one or possibly two were required to undergo re-baptism. Nearly all of this family background was unknown to me when my own involvement lapsed more than four decades ago. Genetic expression is different among decedents but some traits are apparently very consistent. There are very few with my pedigree today in that spiritual tradition and possibly even fewer with a legacy of such orneriness. But I wouldn’t trade those genes or my heritage or my cultural values with anyone.